Liv Salades is a new spot on Saint-Laurent in Montreal that offers healthy salads, bowls, raw balls, with plenty of vegan and veggie options. They have now kicked off their brunch for the healthy city chic crowd and it's delish! 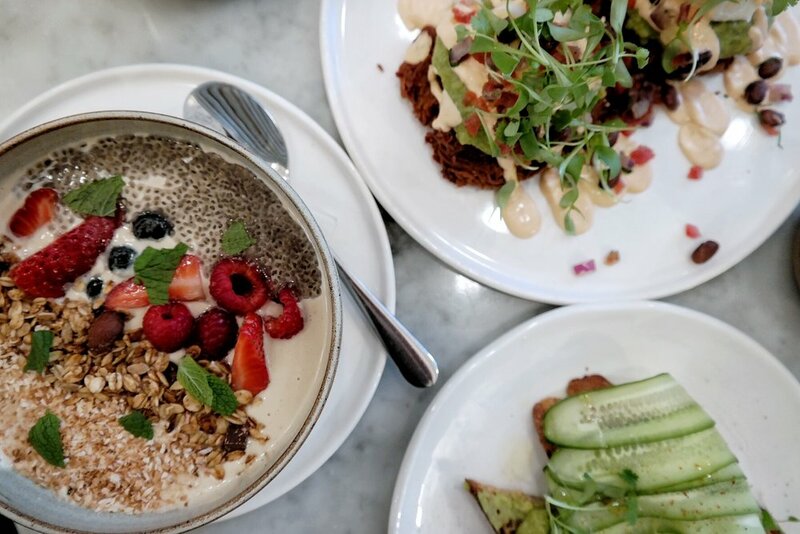 Of course some of my fave reporting is on brunching in my go to cities, but finding locations that are packed with tons of healthy options is like hitting gold... and not always the easiest! Here is why I personally love weekends .... because you get to refresh and plan your week ahead! I enjoy thinking in advance, so instead of stuffing myself with the last of the weekend's regrets I prefer to hit up a healthy spot, do my healthy groceries for the week and take a few hours at night to prep meals and plan out my days. The food is delicious and the presentation is on point. Trendy and perfect for instagram shots (lets be honest!). There is a lot of thought that went into the prep and beautiful presentation of the fruits in the dishes I ordered! There was a type of original effort we do not alway see here in Montreal... to me, looked like some of the great things I see in Autralia! The space is quaint. Small and adorable inside. It is a mix of high bar seating, small bistro style tables and a long table perfect for groups. The bathroom wallpaper is a must see. Check it out!... The only thing, you will have to make your brunching here on a Saturday since they are currently closed on Sundays. Sorry folks! A combo of breakfast's best with an added list of their clients favourites from the regular menu, the selection is curated and perfect. 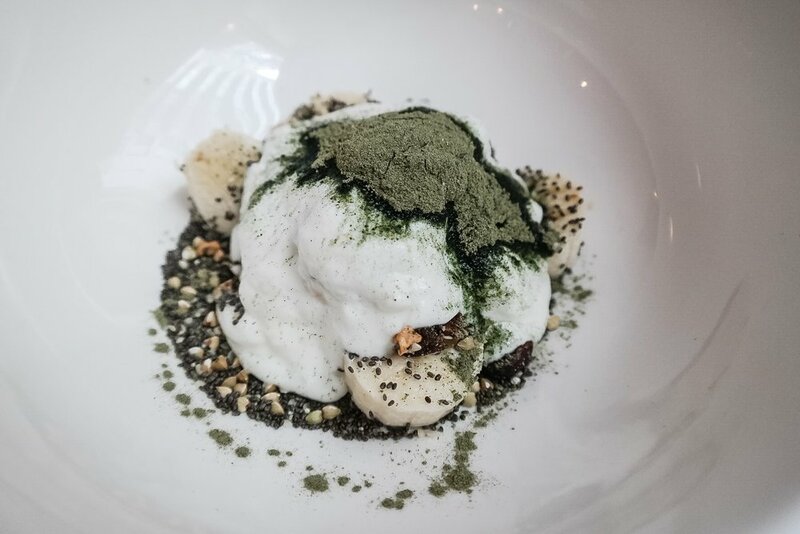 My fave item on the menu, Vegan Yogurt with toasted coconut, homemade granola, berries, chia pudding and mint! It's not the easiest to find vegan yogurt and this bowl is delicious. A must try even for dairy eaters. I also munched on Avocado Toast and their LOV Benedict. Delish! 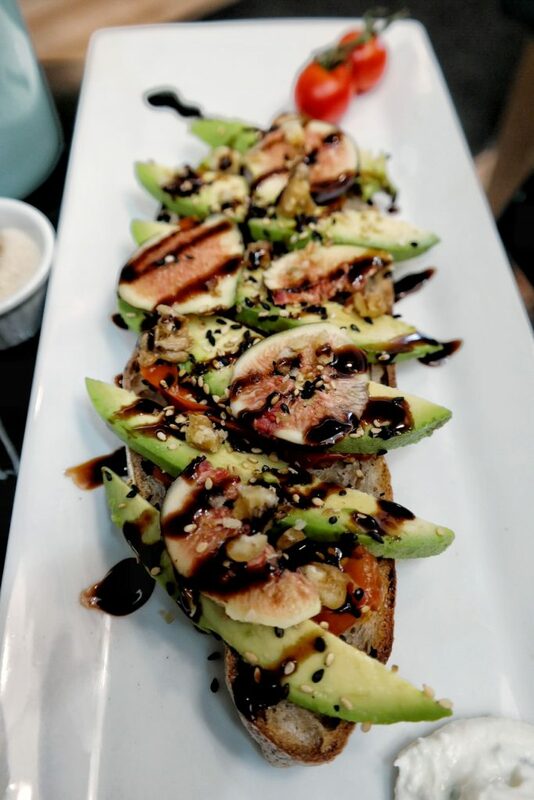 The toast of the avocado toast was delicious and whole grain. The way the avocado was prepared with spices and sea salt was perfect all topped with fresh cucumber. I ordered a few dishes..... Pretty full but super healthy eats never leave you feeling low even on a lazy Sunday. It's the perfect combo for a healthy but casual weekend. Plus, no need to break your bank or diet here. Health eats for a great price. Just a phenomenal job well done. Did I mention I love the staff? Very accommodating and I've been in a few times now... Since I live right next door! They always say hi and remember a familiar face. I could hang here all day. Enjoy your weekend and make sure to check it out! Waking up to a healthy breakfast is fabulous, especially when you have a bit more time to make what you want... like on the weekend! I personally will wake up extra early just to have the time to make what I want to eat and digest before the gym, a meeting, showering, starting to write etc. 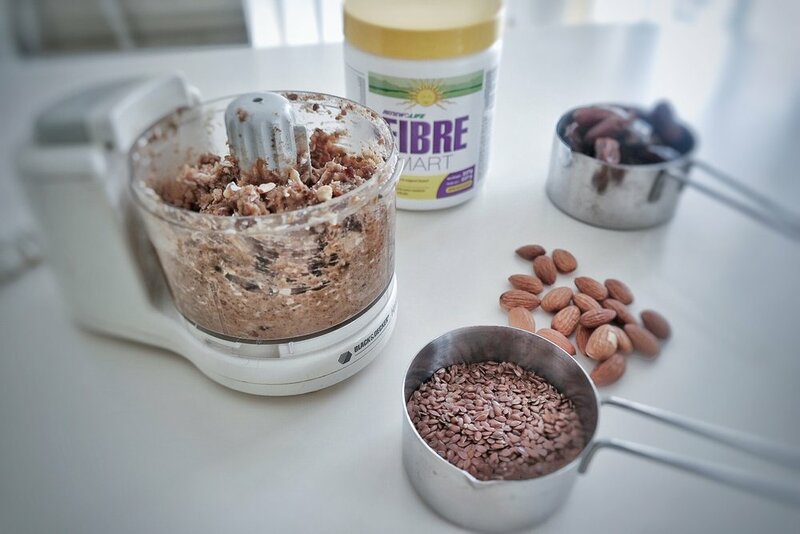 Here is one of my fave recipes that is packed with so much protein, fibre and healthy fats to start your day. This will leave you full far into lunch hours so you wont be complaining or reaching to keep your blood sugar up. Yes please! Optional to add more fibre or protein in from your fave brands. 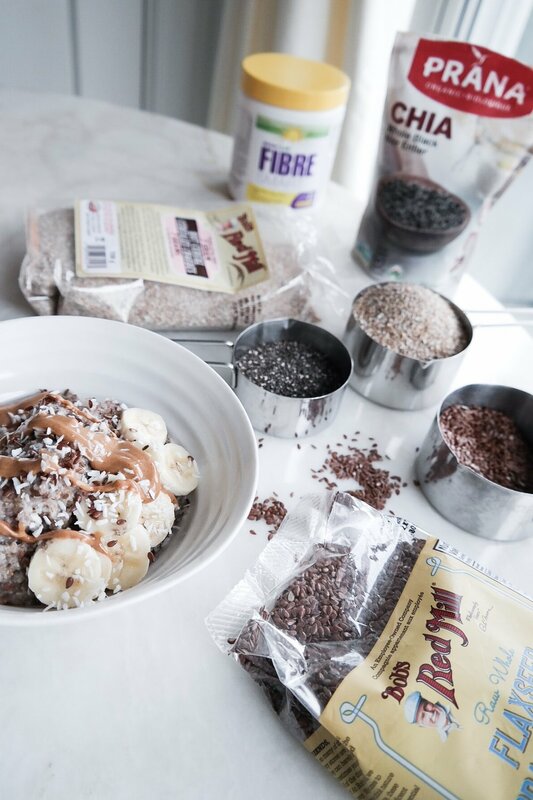 I added a bit of Renew Life Fibre(my fave) which I always have in the kitchen to sprinkle on, along with a big of plant based protein from Move Protein. The protein if flavoured can spice up the recipe a bit too. They have vanilla and chocolate for a little extra sweetness. Cook the 7 grain cereal and add in the chia seeds, the flax seeds and the fibre as you cook it. I then cut up banana and added it on top but you can also mix it in while cooking if your prefer. The taste will be stronger. Drizzle nut butter to your preference on top. Sprinkle more flax and some coconut on top. You can be as healthy as you want to be..... Eat all the right stuff and work out as much as every day, but no matter what, stress can get to you! Did you know that only 50% of your health is based off of what you eat and how you move.... ONLY 50%!! Crazy right. The other 50% is your mind. Woah. Did you know stress actually makes you secrete your natural flora? Flora are those healthy bacteria in your body that fight off the bad and regulate your immune system. It's why we take probiotics that have different flora counts. So basically stress does tons off BS to our bodies. They actually break down from stress. I feel like we hear this all the time. We just never really grasp the severity of it until it happens.... Well I get it now. I was going through some pretty bad stress the past year from a toxic work situation and I have been through the roof with stress. Working out and spinning has helped a lot but that isn't everything. A big part is mentally digesting and moving on from the stress. Accepting it cannot "get you". I wound up with a bad virus and stomach infection from the stress. But because stress creates us to secrete the healthy bacteria flora (or probiotics) that allow us to fight this off we get sick. Sick like infection sick. Like we need to take antibiotics and can't move for 5 days sick. Infact the antibiotics didn't work. I had to switch to another kind because I was still crazy sick and still had a burning stomach from the stress and anxiety. What shocked me most was that I wasn't sitting there 24/7 thinking wow feel stressed. It was just normal resting state for me at a certain point. I just thought my life had come to that. Weird right? And a lot of us do and we let this be part of who we are. We have no understanding of the difference until you remove yourself from what's causing that. A bad relationship. Or a bad job. Or an unhealthy living environment. Or money problems. Or toxic friendships. There are plenty of reasons and sometimes many. They say how you do one thing is how you do everything. So if one part is bad usually the other parts are out of line. Ever notice that? Omg my house is a mess and I don't know how I'll pay rent and etc etc job starts going wrong. Relationship starts being a burden and you fight. It all ties together! Look there is tons to explore in the realms or stress. Tonssssss.... our mental health is 50% guys?! But what I really wanted to bring to everyone's attenterions today is getting sick is adirect link of stress, whether your doctor looks at you and says umm you should quit your job and go to the gym (LIKE maybe when you go back to him still that sick THREE times) ... it's scary. But if you don't have healthy bacteria. If you can't even keep it in your freakin body. YOU WILL BE SICK! TAke probiotics daily, my fave is Renew Life daily probiotics. And foods fortified with probiotics like chia seeds and yogurt. KEEP that production up! And what's most important is taking care of yourself. Go to the gym, turn off and tune out what stresses you... maybe it's social media or your job or your relationship. Or all three! Take time away and get in tune with your body. If you don't know what's stressing you then try meditating and listen to the parts and worries that won't stay out of your mind. it's usually these that are your biggest problem! What stresses you guys most? Earlier this month I announced I was becoming a certified health coach. I wanted to introduce all of you to the process and the fact that, yup I talk the talk, but now I'll have a solid certification behind my words. It's really for all of you and to bring you the best and most accurate content to achieve your ultimate health. I've toyed a bit with the idea of how I could take you thru this journey with me, teaching you about some of my fave brands along the way. I decided since there is so much to come in the future in terms of health and wellness content , I would take this opportunity to share with you once a month part of my story, health struggles and how I became so fascinated and quite frankly in love with the health and nutrition world. For years I've read about health and nutrition. So if we are going to tell the full story we will have to head back to the beginning. When I moved to New York City to attend college at FIT I took this love with me. But this is where I really had the time to grow. Mostly because I embarked on this crazy adventure alone at the age of 20, but also because I had plenty of free time alone in a new city. Ill be honest, moving away alone at a young age makes you feel a little lost... okay a lot. I was a lot lost. I dedicated my time and energy to understanding health and at that time (I'll be brutally honest here) I wanted to be thin. Very thin. Maybe it was a control thing because I was away on my own, or maybe a body image issue. I'd say a bit of both. During this time I battled with unhealth habits which I'll get to in the coming months and of course was introduced to my first taste of living in mass production America, but in NYC... SO picture this.... Everything was low fat, low cal, sugar free .... and packed with chemicals, sweetners and basically a how to manual of health self destruction. YUP. I ate zero calorie noodles with low cal sauces for dinner. It's a thing. Let's just say you don't digest... anything. I did a lot of things that were unhealthy... that's the first thing to recognize... and naturally I lost a lot of weight. Part of me didn't care. The part that saw what was in the mirror mostly. I was young and just wanted to look "good" by the standards of NYC fashion world. I do feel it creep in every now and then. When I catch myself mid way thru the day running on nothing but black coffee and sugar free gum. (Still happens sometimes , it's like a high) But I don't do this out of choice anymore. And trust me we'll get to discussing habits as this continues. Then something crazy happened. I discovered Whole Foods and trader joes. And I fell in love with health food. My focus on health began a shift, albeit slow and steady from one adorably labeled fresh juice to the next, but a shift. I fell in love with the food industry but beyond the science of how to count calories and "eat yourself skinny" but on the actually marketing of brands and the content of the food. After returning back to montreal I hit a bit of a depression. I was no longer in my fast paced independent life I had created for myself in NYC. I was home at my parents (whom I love dearly don't get me wrong) but it all felt like a back track. A loss of control. And one of the hardest parts and still is today is that I was no longer able to run to my fave place, the health food grocery store. We don't have anything quite comparable to these that they do in NYC. I dove into a demanding job and I lost a big part of what made me happy. Regardless of how I approached it, since I can remember the health and happiness world went hand in hand. I gained enough weight to make me uncomfortable in my skin. I focused on giving to my job and not to myself. I was no longer in control of my time, my mind or choices. I felt I had no independence. Life gives you what you need when you need it, so naturally thru rediscovering my happiness, a few months later life brought me back to the health world. It brought me Victoria Park and someone who has been a guiding factor, a friend, a trainer and a mentor in all of this, Drea Wheeler. You all know my love for Vic Park and my ride tribe so I won't get too much into this (plus have a fun spin post coming up this month) but let's just say this place and this incredible person have both been huge guiding lights. So here I am.... starting my health coach training to bring you guys incredible content, and to reroute what brings the happiness back to S.
I am so excited to share more realness and raw stories about my health struggles and health coaching journey with all of you, but in the meantime comment or send me via an email if you have anything specifically you're excited to learn about. If I start my day off in the wrong way I am totally thrown for a loop. My work is off and the center of my emotional balance is off. Everyone's day can start differently to make it great... For me I just need enough time to wake up, have a coffee and a healthy breakfast, get dressed and walk my dog. I can't stand feeling rushed in the morning, I certainly can't stand feeling unhealthy! I need to make sure I start it off with the best possible breakfast to set the tone. (You know those days you had sugar for breakfast and can't shake the feeling of crap all day, yeah those! Worst night mare! )So personally I need to feel confident and in control heading into whatever is waiting for me that day. Like I just mentioned, my outfit needs to make me feel great but so does my body and my health. If I ate like crap the night before... worst wake up. I taught myself a trick. It's called actually listening to how you physically feel. Head ache... probably not enough water. 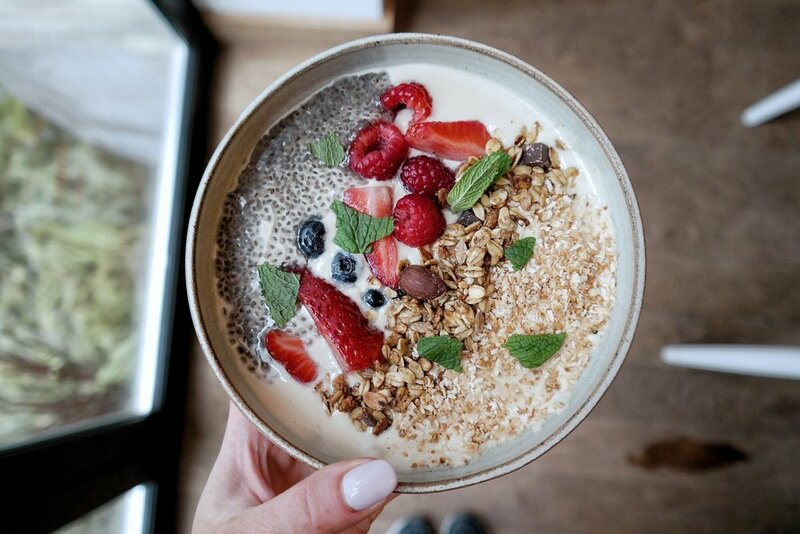 Cravings at night.... probably should just head to bed and dream of that healthy breakfast waiting for you. I wake up so excited for breakfast. There is no way that it's just me.... It's one of my favourite meals. Smoothies, yogurt, coffee, eggs. We need energy to get ourselves going. I swear I've been chatting so much energy and protein recently but it's true especially as we head into the winter. 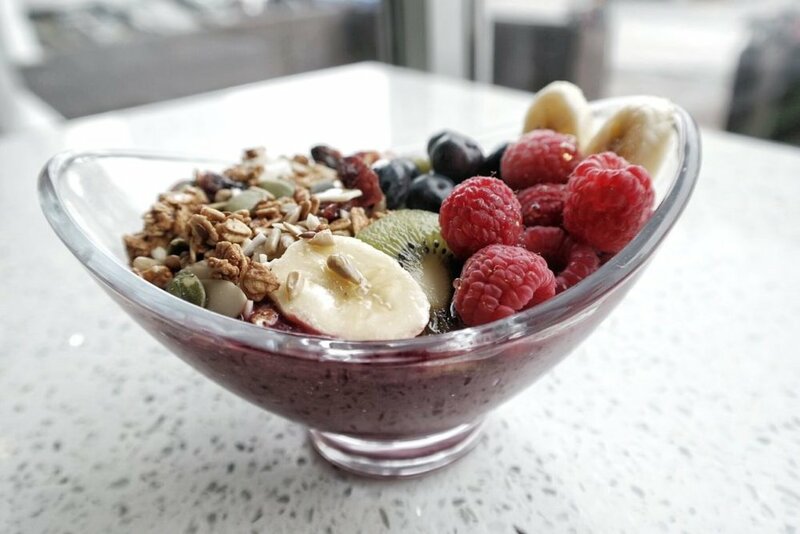 My go to breakfast which is no surprise to those who follow my snaps and posts are smoothies or smoothie bowls, but I wanted to share an option to that which I recently have been trying out. 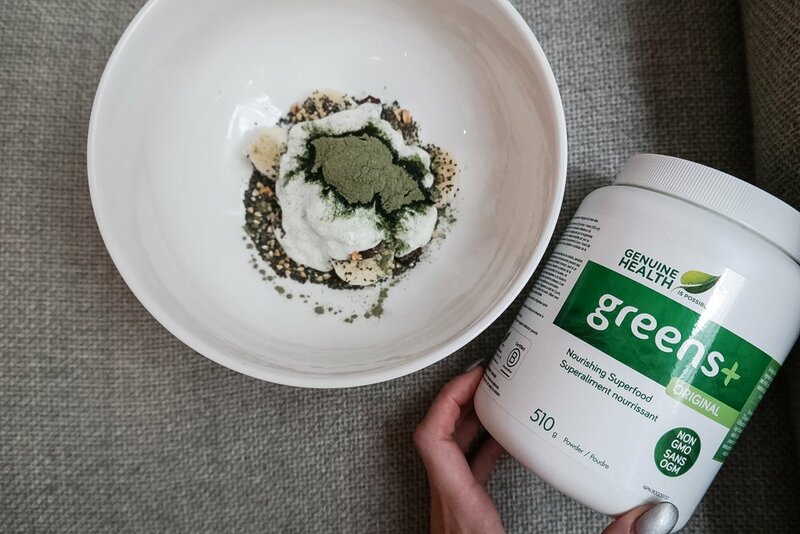 I shared with you all my new love for greens+ by Genuine Health, but here is one of my new favourite recipes in hopes of inspiring you to send me some as well…. so don't be shy. This recipe is what I like to call a smoothie without the blend! Its similar ingredients to my favourite smoothie, but instead it’s the deconstructed version. I pic something as the bed to the recipe, could be seeds, nuts or chia. I top this with cut up banana (could also be substituted for avocado… or both! ), followed by your favourite yogurt. I like 2-3% plain greek yogurt… don’t worry about the fat content. Its good fat and protein and you won’t be consuming tons. I then usually add another small topping like flax or coconut, and a dab of peanut butter. Finally you sprinkle on greens+ by Genuine Health for your green dose and voila. 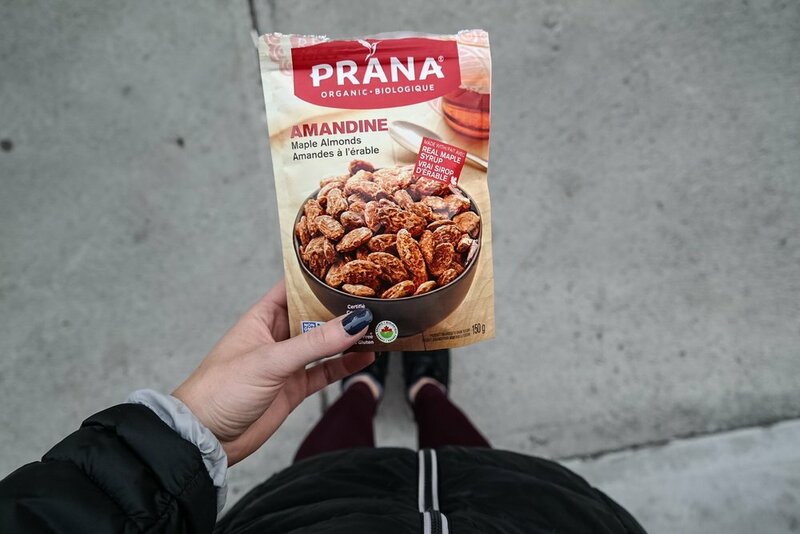 Its delicious and keeps you full into the day, jam packed with energy and protein! It's so yummy gang I promise! Check out the chart below on the benefits of greens+ and this past article here for a little info on why it is perfect to boost your morning mood. Let me know what you think! The colour of the season? Green! And I am not just referring to my Zara fashion haul last week. It seems everything is going green just in time for the leaves to be, well, not! What I’m referring to is the new line of greens+, the superfood boost I’ve been adding to my smoothie this season! You can also add it into your water, shake it up and go for easy on the run benefits. But what’s all this green talk this season and why should you care? Well if you want to keep your energy levels high through the winter cold, keep reading…. 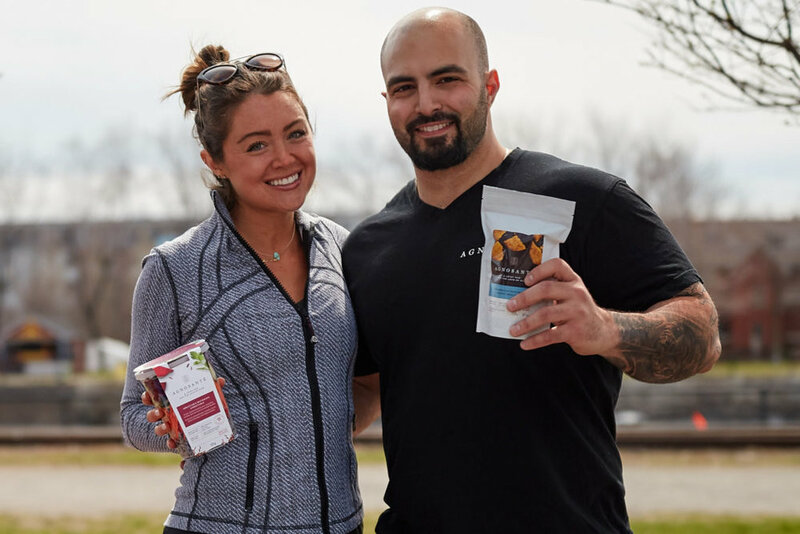 I recently tried out the Genuine Health greens+ superfood formula for the first time and I have to say I was very impressed. Not only is the mix healthy but the taste is mild, tasting great blended with my usual favourite combo of berries, banana and almond milk. But why add anything to an already healthy smoothie (even if it’s a super food mix that has zero GMO veggies)? You see, superfood actually does make you super (research shows I swear!) and I am not one to turn down an enhanced super energized version of myself, are you? Yup, I write a blog about finding the silver lining….. The happiness found in working out and staying healthy have become a HUGE part of that. So, the idea that you can boost your energy by adding greens+ to your daily smoothie is pretty happy if you ask me. I have a lot of energy, which means I use a lot of energy… mostly on things like keeping others around me excited, hitting the gym, running a brand and working full time (yup plenty of you don’t even know I am still doing this!! )… and well, energy is power, literally and figuratively. Getting up early, staying up late when you need to and remaining focused, hard-working and in control are the keys to success. Staying healthy is the biggest part of that! Greens+ is Canada’s first and only research proven superfood formula. All of us canuks love anything native to the land, and some good research that helps us understand these new health facts don’t hurt either. So what are the benefits of upping your intake of this synergistic blend of 23 plant based nutrients? Yup 23. Well for one, you intake plenty of natural plant based energy from the earth, keeping your body where you want it, strong and focused. Benefits include ingesting daily superfoods, enhanced performance, improved cardiovascular health, mood and cognitive function, digestive health, increased energy and vitality, and regulated pH acid/alkaline levels in the body. 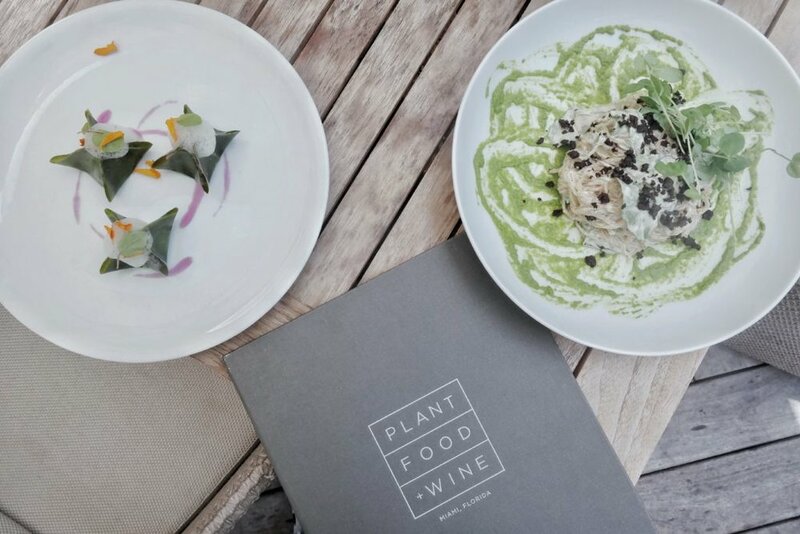 Greens+ is known for having started the green food revolution (yes!). 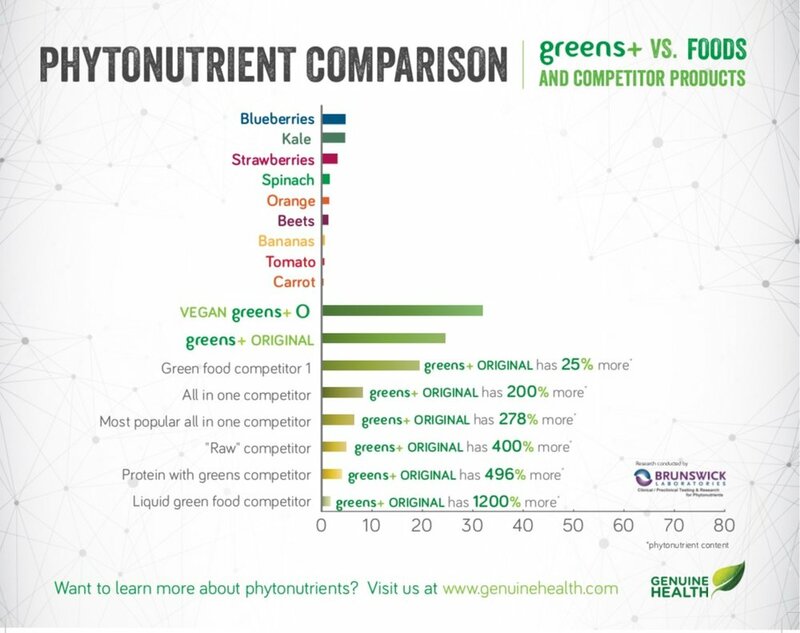 According to their website, research has been done on the mix proving it increases your energy and overall well-being (makes sense since green veggies make healthy bodies, and healthy bodies run healthy people! ), provides highest Oxygen Radical Absorption Capacity (ORAC) (this is basically a measure of how the body detoxifies with antioxidants! ), promotes bone formation and osteoblasts (those single cells that together play the role of bone construction and reparation) and it also promotes the body to reach its highest Potential Renal Acid Load (sounds strange but is pretty much a measure of how acidic or alkaline the body is… more alkaline body is known as a less inflamed healthier body, just ask any vegan!). Which brings me to the vegan side of the things…. 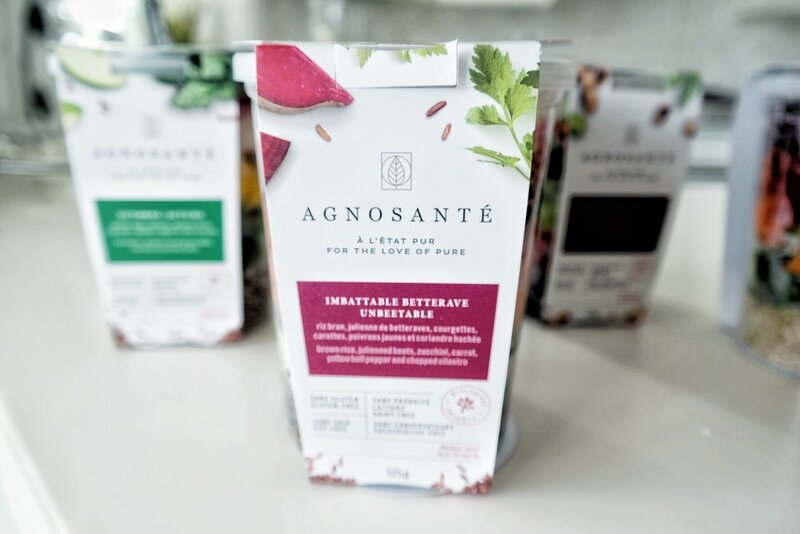 Genuine Health created new vegan greens+ which is essentially very similar to the original formula, keeping all the benefits and the parts that appeal to health enthusiasts but removed any allergens, replacing them with ingredients like spirulina, broccoli sprouts, chia seeds and sunflower lecithin. 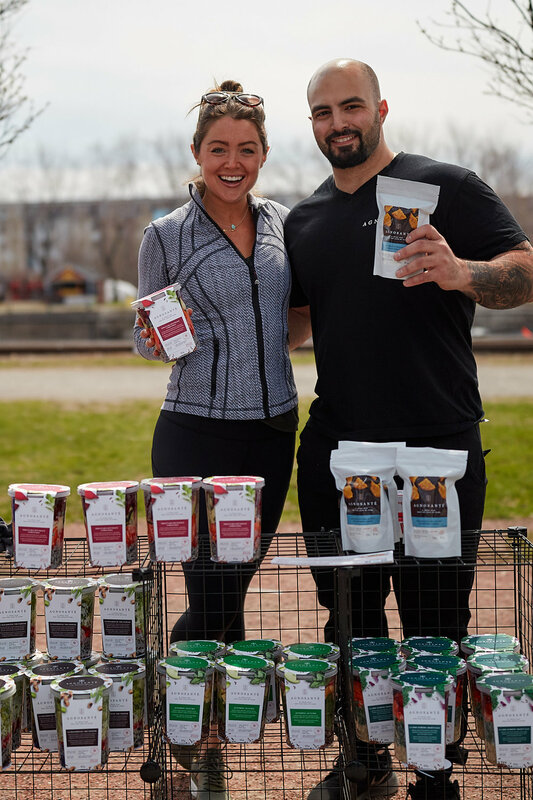 The vegan formula also comes in two additional flavours, mango and acai all while being wheat free, gluten free, soy free and dairy free (sounds pretty good to me!!). Additional benefits of the vegan formula include awesome digestive health benefits. Fall marks the changing of plenty of things. For one, the weather! Cooler nights and shorter days, resulting in our changing energy levels during our day to day active life. So where does that leave us? Well, often reaching for a little extra energy boost (sugar!). Fall means pumpkin spice lattes, maple pies, and muffins to boost our spirits. Don't get me wrong I love the occasional PSL, but when muffins turn to muffin tops, not so much. So how do we balance the two … I mean it's fall after all and what's a Saturday at the market without your favourite flavoured latte? 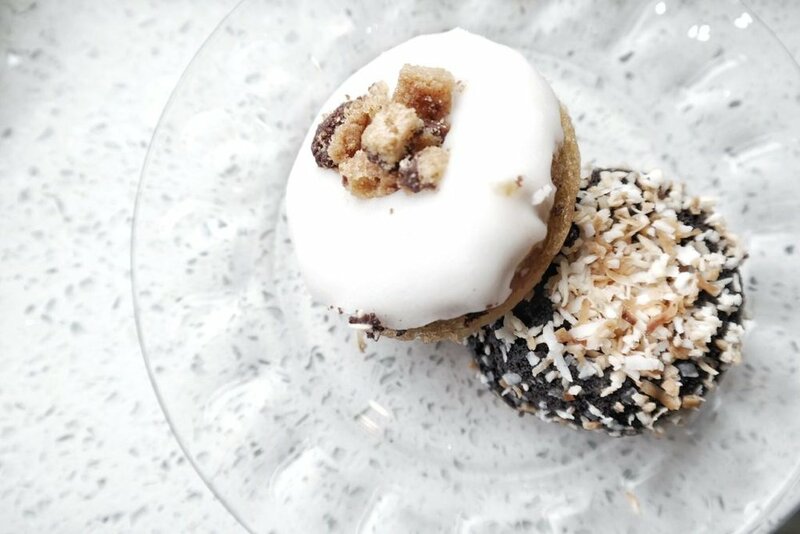 The part we often forget is that we reach for these sugary options to feed the emotional desire for fall (kinda like I just mentioned), rather than energy which is what we really need during this season change. Sugar does not equal energy friends!! Get that in your heads. The alternative to stick to summer’s healthy habits? A nutritionist friend of mine introduced me to the concept of protein. Seems simple enough right? Wrong! I was not getting nearly enough protein and honestly am still learning half of what contains valuable levels of the energy fuelling molecule. As a veg it's hard to get the right amount of protein to keep my body fuelled with enough energy for my day to day (running to events, spin class and other healthy lifestyle regulars). I eat seafood on the rare occasion, but rare seems generous most recently. My hesitation to meat (just the fact that I don't like the idea of eating another living thing - gross!) has translated to fish and other seafood. As a result I find myself eating a lot more nuts, seeds and soy based proteins. is easily accessible at plenty of grocery stores and deps in the greater MTL area - p.s they sell them at Mandys crescent! They also offer great dried fruit, seeds, chia, coconut shreds, maca powder (another energy booster I adore) and raw coconut oil. mix after this article, but first let’s recap some benefits. But out of all of the protein why nut protein? Personally I turn to nut protein because I don’t like many of the other kinds and am not too keen on loading up on too much soy. 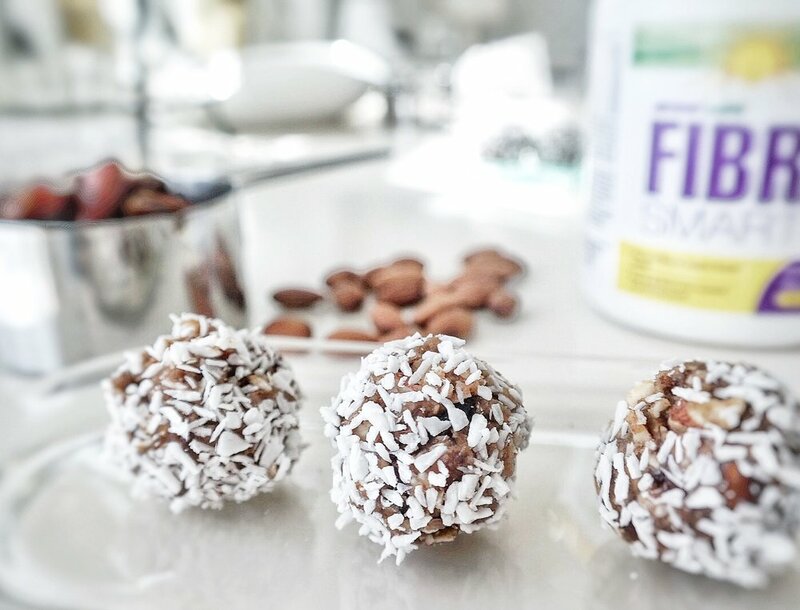 Plus, yes nuts have plenty of protein you’ll be needing this fall, but besides from that they also are a source of unsaturated fat (good fats counter act the bad fats), fiber, vitamin e (a great antioxidant) and omega 3 fatty acids. It’s not quite drive through, but I promise you, ordering at Vertu is almost as quick. 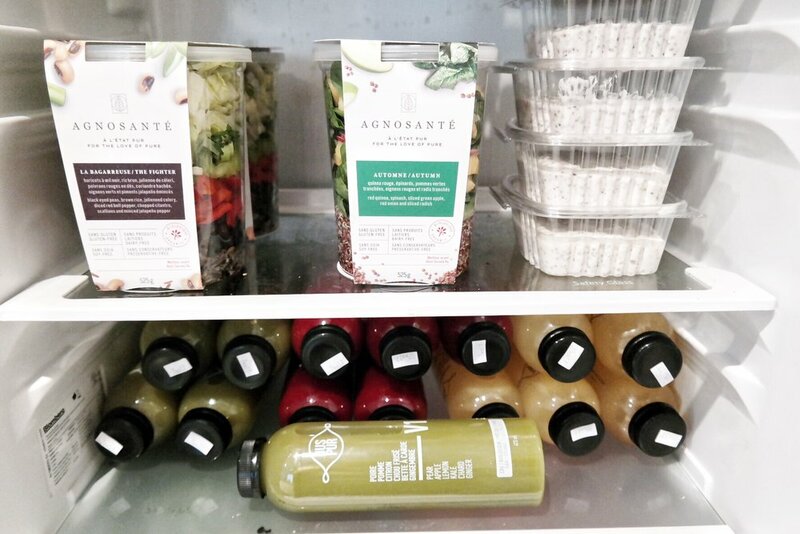 Located in the Mile End, you can grab your salad, burrito bowl, fresh juice and so much more on the go. Run in and your order is up fast and delicious. A small note however, no matter how fast you are stopping by, make sure you leave time to snap a pic of their spectacular floor (trust me you’ll be doing it anyway, time or not). This is one of the best healthy restaurants I have tried in Montreal, and they do not play it safe with a mix of flavours. The mix of things like squash, apples, olives and beans make for some mean burritos. They also have amazing infused water that can recharge you on your busy day. There is something for everyone and still keeps your healthy. The options are also pretty filling which is great if your running around and need to keep your energy levels high. My suggestions: order the burrito! You can’t get out of the office to grab anything! If you are stuck in the office, no stress! 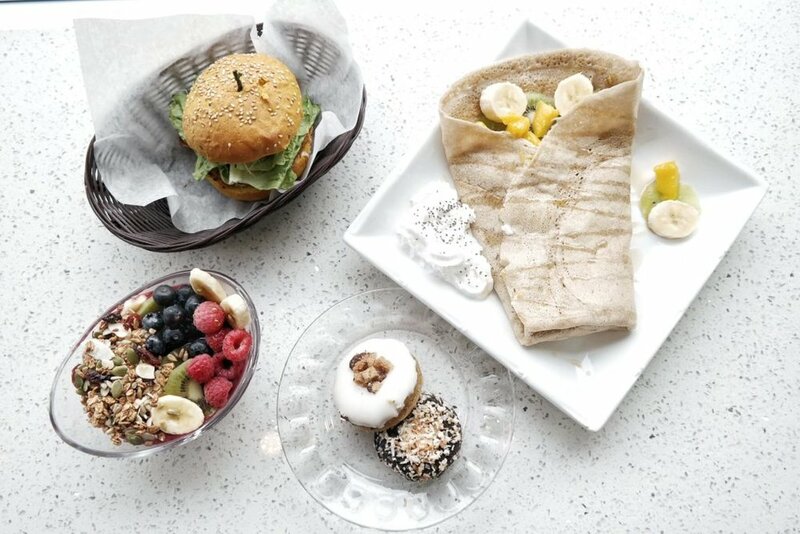 Chef on Call can deliver you a healthy wrap right to your office. This we like! 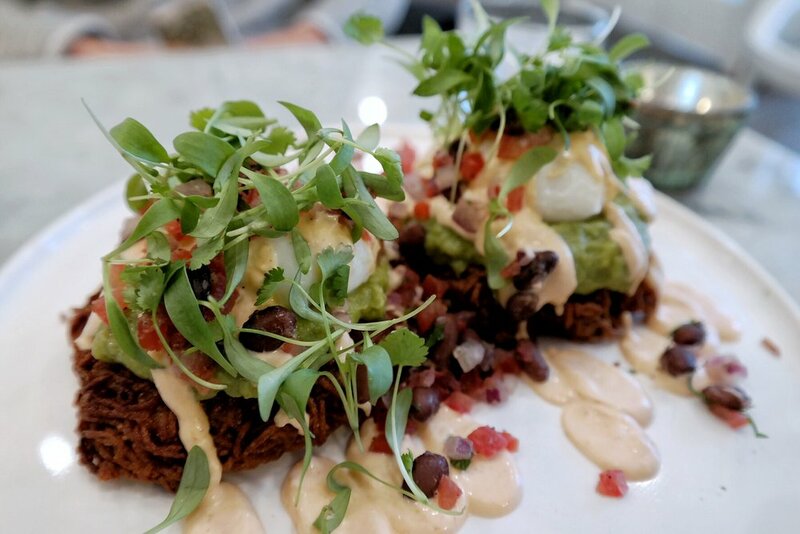 Best known for the fact that they offer delivery until 4am, Chef on Call recently moved to their newest location on Park Avenue, just above Sherbrooke street, offering a welcoming eat in environment. They also run all of their delivery orders out of this spot throughout the day so they certainly have their work cut out for them. In the center of the McGill university buzz, their popularity comes as no surprise and continues to grow. Partly thanks to the fact that they cater to anyone who wants a poutine to a fresh wrap or salad. The food is good and is not trying to be anything fancy, besides good food for people who are hungry. And the new design inside is pretty cute! Nothing short of a little pinterest inspiration discovered by co-owner Gabe while designing the new spot. Delivery is simple and easy. My suggestion: order the spinach salad with goat cheese, honey toasted nuts and raspberry dressing! You have back to back meetings all day! Let this healthy spot solve your problem of back to back meetings. 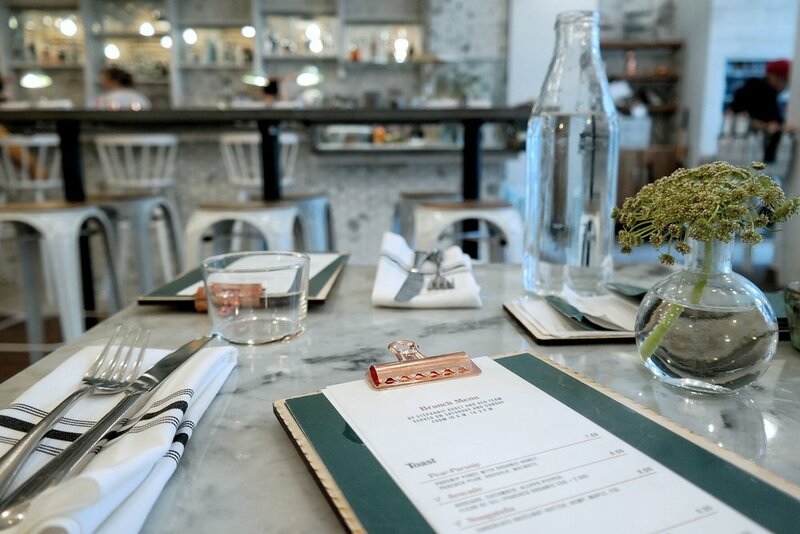 The perfect spot to schedule a lunch meeting is La Bistrote. Centrally located in Griffintown, minutes away from the Old Port, Downtown Montreal and St Henri, you can schedule one of your mid-day meetings here. The prices are great for what you get, so you can treat whoever is joining you, the location is adorable with inside and outside seating, and the food is delicious. 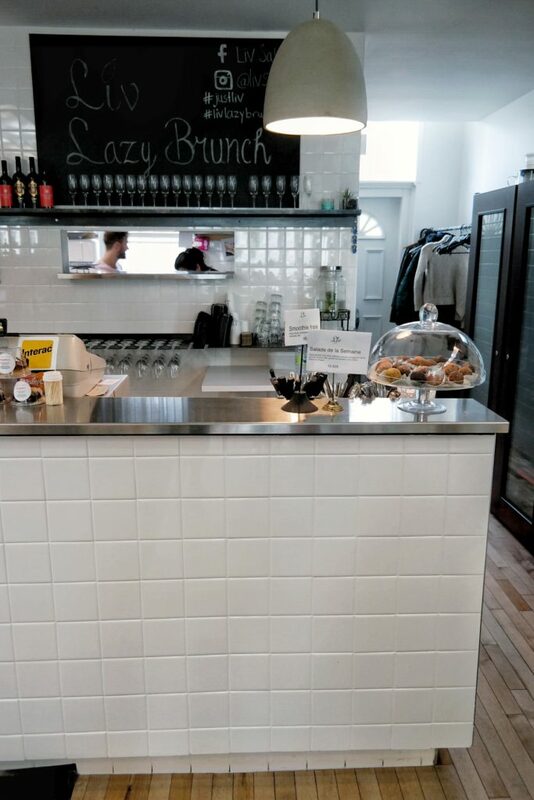 The spot is the perfect combination of a cute lunch café, but is not too packed or overwhelming to really get down to the nitty gritty reasons of your meeting. Bonus, they have amazing iced tea and iced coffee for your after lunch pick me up. My suggestion: Order the Mexican Salad! If you follow along on my snapchat (@samanthaecutler) you see all sorts of snaps about my healthy eating routine, especially in the morning. Pretty much every morning I make a smoothie bowl. People always ask what the difference is between a smoothie bowl and a smoothie. Honestly, not much! It usually should be a pretty thick smoothie to be able to eat it with a spoon or else you’re looking at too much of a liquidy soup consistency and no one wants that! Then once you have your base you can top it off with anything you want, fruit, coconut, chia seeds, peanut butter, you name it. Here is my go to quick and easy smoothie bowl I have almost every morning. I top this off with coconut shreds and coconut chips. Sometimes I will add peanut butter or banana slices. Try it at home. So delish and I will share more recipes with you coming up!